DAEGU – Surrounded by the bustling city life of the Seoul metropolitan area, many look for chances to see some greenery when planning trips to other regions of Korea instead of going to other urban areas that may have similar features as Seoul. However, Daegu takes pride in being different. It opened a monorail that runs through the city in April to show off the city’s skyline to visitors when they move from place to place. The city government even set up a travel route to bring visitors to its music and food districts. On top of the convenience the city offers, many historical buildings from the early 1900s have been maintained, whereas such buildings in the Seoul area have been ruined or renovated. The late Kim Kwang-seok (1964-96) is a singer that many learn about in their late 20s, even if they had no prior knowledge of him. With one of his most famous ballads, “Around 30,” exploring the feeling of being lost in time, many approaching the age of 30 get a chance to hear the song at least once or get hooked to delve into his other songs. He is also famous among young soldiers for his song “Private’s Letter,” which talks about the mixed feelings of being enlisted and how a letter from friends can be a way to connect with the rest of the world. To honor the singer, who has touched the lives of many with his tunes, his hometown of Daegu has set up a road in the city named after him. The road, which opened in 2008, was where the musician used to hang out as a kid. At normal walking speeds, one can easily stroll down the alley’s 350 meters (1,150 feet) in a couple of minutes, but paintings on the walls along the path beg passersby to stop and take a look. Many artists and laymen contributed their talents to decorate the walls with their interpretations of the musician. Some drew Kim’s smiling face, and some painted props that are reminiscent of the singer, such as a red-colored mailbox where one might put in a letter to a private or a guitar like the one the late musician used to play. Kim’s music is continuously played through speakers set up along the road, letting visitors listen and recall their memories as they stroll along. Considering Kim’s songs are relatively slow, quiet and calm, the walking experience is even better on cloudy or rainy days, when the weather is aligned with the mood. Among the five tour courses the city government recommends, the second course, “Modern Cultural Street,” is the most popular. While walking the tour route, one can not only trace the origins of how Western religions found their way into the city, but also learn more about independence activists who fought during the 1910-45 Japanese colonial rule, such as Lee Sang-hwa (1901-43). The city has maintained many of the early 20th-century buildings well to make visitors feel like they have entered a time capsule. Cheongna Hill, the area where Christianity first settled in Daegu, is surrounded by early 1900s-style red brick houses where many of the American missionaries lived. The First Presbyterian Church of Daegu is the oldest church in town. Many of these former homes are now used to store and display small artifacts handed down from the era. About a five-minute walk from the hill is Gyesan Cathedral, the third Catholic Church to open in Korea after the ones in Seoul and Pyongyang. What may capture the eyes of visitors – even those of non-religious people – are the stained glass windows that feature people in traditional Korean garments, or hanbok, to honor the many Catholics who were oppressed for their new religion as it spread throughout the country. Besides the religious buildings, many older homes of renowned officials are now open to the public to view for free. Located just steps from the main road is the house of activist Lee Sang-hwa, who wrote a famous poem the title of which roughly translates to “Does Spring Come to the Stripped Field” in objection to Japanese colonial rule. Taller buildings surrounding the old house block out noise to give it an ancient feel, but it is still easily accessible. Detailed information on the historical background of the buildings is also available. There are five such tours, and one of the popular routes includes the religious buildings and older homes. If a group of 10 or more requests a guide, the city government will provide the service for free. English guides are available, and Chinese guides will become available soon. The city’s newest train route, line No. 3, is a monorail. The railway opened in April and takes visitors to many of the popular sightseeing destinations. It is more popular than other subways, as riders do not have to waste time while on the move and get to see the cityscape from various angles. To check out the entire city, just sit on the train, which takes about 50 minutes to make a full circuit. However, riders should be aware that the windows cloud over when the train passes close by certain buildings for privacy reasons. 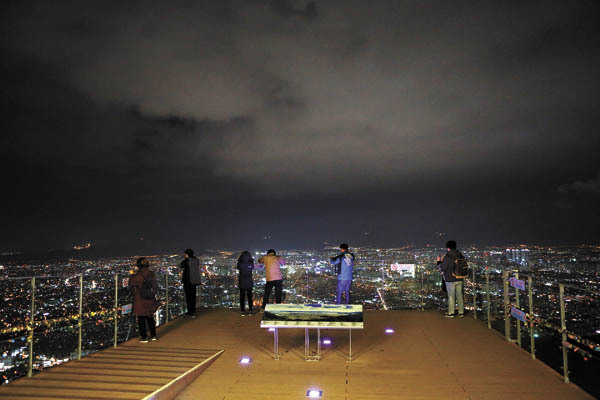 Apsan Park, also known as Apsan Observatory, is the place to go after dark. The nighttime cityscape comes into view after a cable car ride that lasts just a few minutes. Upon arriving at the top, most visitors get busy capturing the bright city lights with their cameras. Through January, the last cable car down from the top is at 7:30 p.m. on Fridays, Saturdays, Sundays and holidays, and at 6 p.m. on weekdays. The cable car costs 9,000 won ($7.80) for adults and 7,000 won for children and elementary school students. What traveler would not want to get something good to eat after walking all around the city? In the bustling Seomun Market, which used to be one of the three major markets during the Joseon Dynasty (1392-1910), you can find something for every taste – savory, sweet or spicy. Another perk of visiting the market is that the food here is cheap. The locals tell a joke that three people can fill up at the market with just one 10,000 won bill. While many traditional markets struggle to stay afloat, this particular market does not seem to worry about such a thing. Even on Friday after lunchtime, the alleys in between stores are packed with shoppers and small snack stands selling hotteok, or fried pancakes filled with honey and nuts, and have long lines of people waiting. One of the most appetizing dishes found in the market is a mix of braised beef and pork in a very spicy sauce. Diners can also choose to add a whole octopus to the bowl. Mixing everything with rice helps balance out the spiciness, which can easily numb the inside of one’s mouth. A basic bowl with just meat costs 7,000 won. Another popular food for a quick lunch or dinner is nabjak mandu, which roughly translates to flattened dumplings. The half-moon-shaped dumplings are grilled and make a good combination with a plate of ddeokbokki, or rice cake with spicy sauce. Around seven to eight dumplings will only cost you 3,000 won. More tasty food can be found elsewhere in Daegu as well. One of the more expensive local dishes is mungtigi, or thick-sliced raw beef. The style of serving a small chunk of raw meat on a plate with a sauce combining garlic, pepper and sesame oil is unique to the city of Daegu. One plate of such a dish starts at 30,000 won. Another specialty here is sundae, or blood sausage, that uses thicker, more opaque entrails for the casing. A small plate costs around 20,000 won. To get to Daegu, go to Seoul Station and take the KTX train to Dongdaegu Station. It takes just under two hours. For more information about the city and to arrange a tour guide who can explain the history, go to tour.daegu.go.kr or call (053) 803-3902.